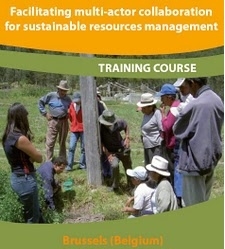 The intensive training course “Facilitating multi-actor collaboration for sustainable resources management” will take place in Brussels, Belgium, from April 16 till 24, 2012. It is a joined initiative of Cycloop, network of experienced action-researchers specialized in multi-actor collaboration and sustainability (www.cycloop.org) and the Centre for Sustainability Management of the HUBrussel (Brussels University College www.hubrussel.be, part of the Association K.U.Leuven). The emphasis of the program is on social process facilitation. The course is directed to scholars and practitioners with experience in local or regional development projects. Candidates from the South can apply for scholarships, covering tuition fee, travel costs and accommodation, funded by the Flemish Interuniversity Council (www.vliruos.be). You can find more information about this training course, including the application form on, the website: www.hubrussel.be/multi-actor. The deadline for subscription is January 31, 2012 and the number of participants is limited to 23.